This tire performed very well in deep snow (2 feet +) and great on wet roads. Supper quiet, soft ride, will have to wait to see how well they wear. Overall a great tire. I have over 104,000 miles on these tires first at my wear bars. Purchased in 2011. Have always loved Firestone even on my cars. Outstanding tires. Bought a set of four three years and 70,000 miles ago. Smooth and quiet with excellent performance. Will replace all four with the same tire this month. Very pleased with product and the price. I have rotated the tires regularly. Had these approximately a month. After initially getting them on, there was considerable vibration in the vehicle and steering wheel. Took back to a different shop than I bought them at and found out all 4 wheels were not properly balanced at the first shop I used. It took most of the vibration out, but still not riding the best. Seem to wonder going down the road. Not happy with these at all. Would not buy again. These tires are just what I was looking for.I haven't run them in snow yet but am sure from the way they have worked so far that the tread design will handle that OK too.I wanted a tire that would handle all conditions without a lot of road noise and am very happy so far. I just bought these today 11/18/14 and the change in the driving is fantastic. The handling is tighter, it rides so much smoother, and in the rain today there was tighter traction on the road. Turning corners it felt much stiffer to hold the turn and road than my older tires. I am very pleased with this purchase. Just bought and new set of four Destination LE2 tires today. It started raining and my truck handled it like a champ! Really good tire. Very little towing so this tire is great for travel. I purchased a van with Michelin tires, and was happy with them. When they needed to be replaced, I wasn't sure the Destination LE2 was going to be as good. I left for a trip in the mountains during the early snow season, and these tires were fantastic! Great traction, even in wet/slick pavement. The ride was quiet and safe. Love the tires! These are the best tires I have ever bought. They are well worth the price. We moved to Idaho at the very end of October 2013. I hated the tires on the Liberty (B*G Long Trail), for anything other than bare/dry. Still had way more than 1/2 tread. Bought a set of Blizzaks. Perfect for the winter, due to snow and running up the mountain to the ski area. Never used 4x4. But they caught the grooves in the highway badly. As soon as it warmed up, grabbed a set of these Destination LE2s. Didn't use them in snow. They look good, great in rain/slop, quiet and grippy without catching the grooves. Balanced with VERY little weight. But I don't know if I'm even gonna put them on this winter. Had the original Destination LEs on a Yukon. The LE2 is NOT that squishy tire. These are much improved. Not all the roads we use are paved. No issues, and they self clean quite well. The voids do hang on to small pebbles sometimes, but nothing bad. I would put this tire on any car, CUV or SUV, as long as heavy towing wasn't an issue. They are a 107T. If they made this in a 120 or 123 "E," I'd likely buy another set for the F-250. I don't usually give 5s. This tire is a 5. I'm surprised it doesn't have a mountain and a snowflake on the sidewall. Oh. and it's made in the US in my size, 235/70R16. Most sizes are US, then Canada, a couple Mexico, pizza cutters (skinny) mostly. I'm fussy about tires. I'd rather spend more than worry. With the Destination LE2, I don't have to do either. Oh, and I swore I'd never buy another Firestone tire in 1972, unless it came on a new car. Then I'd change them, which I did. I was wrong. 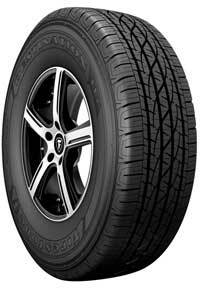 Great tire with low noise and good wear. Have driven about 10,000 miles and tread is still great. This tire was recommended by the salesman but was quite a bit more money than I wanted to spend. Based on salesman, I decided to purchase 4 tires and I would say these tires have performed better than the original tire that came with the vehicle. I have put on approx 15k miles and just love these tires. I will definitely buy them again and recommend to others. Need new tires for my jeep. For the most part, I liked the tires; however, after about 9 months, the skin on the outside of the tire is coming off. That's right, the rubber skin is starting to shed like a snake. Had side wall leak at 600 miles, dealer replaced. Love the tires and service. i bought these tire when my old tires wore out. Now my wife loves the great handling and the outstanding gas mileage she is getting. I will buy these tires again. Great price.